This week’s challenge to the Pop Culture League is to answer this question, What’s your earliest arcade or video game memory? 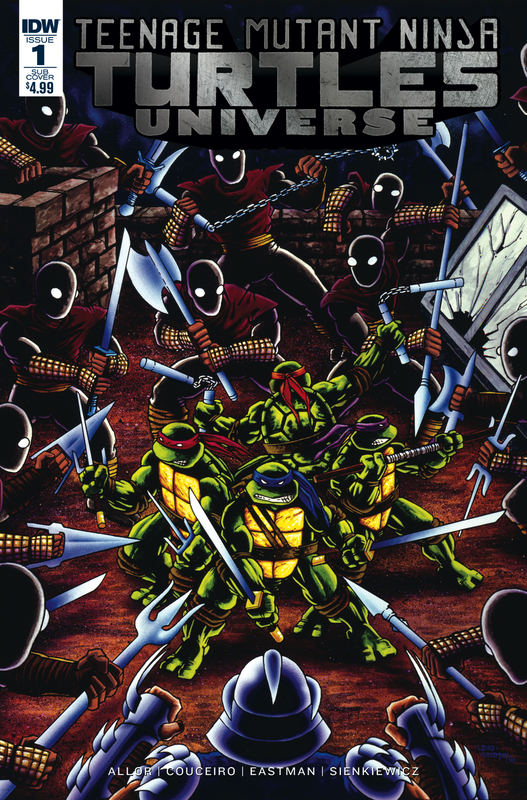 I already discussed one of my earliest arcade memories in a past blog about the Teenage Mutant Ninja Turtles Arcade Game. So instead of rehashing that story, I'll tell anyone willing to listen about my memories of The Simpsons Arcade Game! 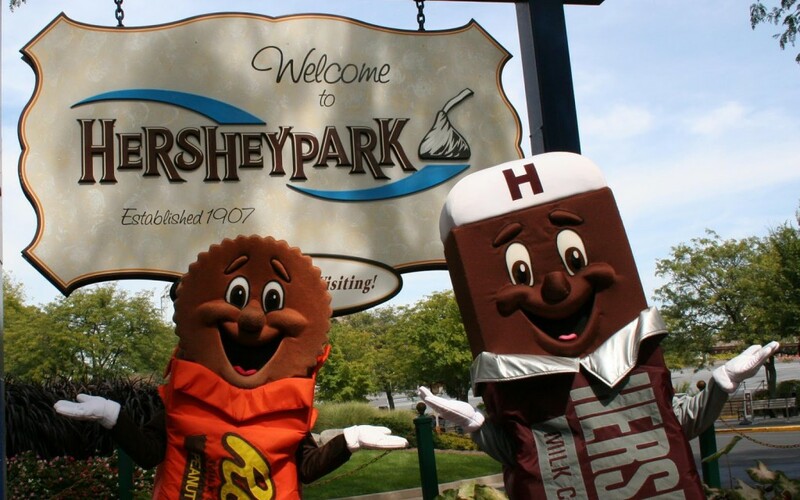 The year was 1991, it was summertime and my parents decided to take the family on a trip to Hershey Park in Hershey, PA. My kids still don't believe that there is a real town in America built on a Chocolate brand with an amazing amusement park, chocolate factory and Hershey Kisses for street lights. Anyway, we loved that place. My favorite ride was a roller coaster called the "Sidewinder". It would take you through loops in the standard forward style, then take you back through the whole ride backwards! AWESOME! 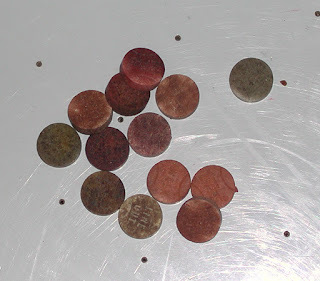 My parents gave us all an advanced allowance, so we could buy food drinks or souvenirs. I want to say it was like $10? 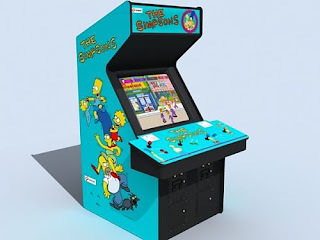 Instead of these usual purchases, me and my older brother found the park arcade and spent almost all of our money on one machine...The Simpsons Arcade Game! This side scrolling 4-player adventure game blew our minds! The graphics were so smooth and well rendered, it was like you were in control of an actual episode of The Simpsons where Homer, Bart, Marge and Lisa need to save Maggie from Smithers and Mr. Burns. 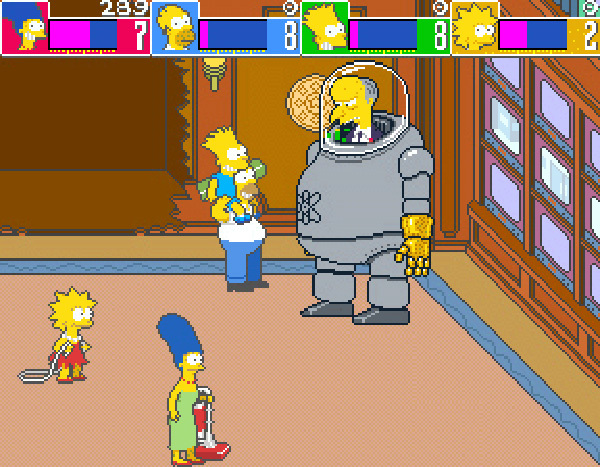 We played and played and played until we finally defeated Mr. Burns and saved Maggie, only to watch the Simpsons throw away the priceless jewel that Smithers was working so hard to protect. 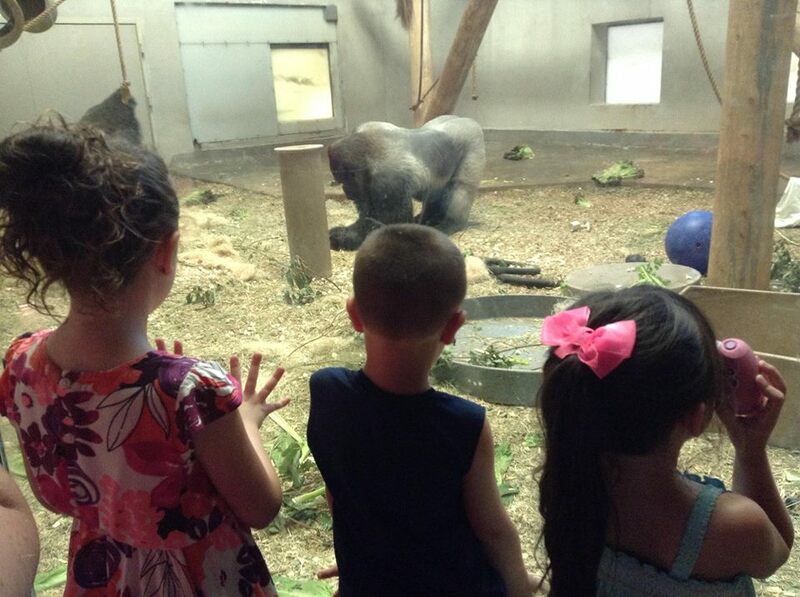 THEY WOULD HAVE BEEN SET FOR LIFE! This ending was not very satisfying for a pair of kids who just spent a weeks worth of allowance each and an hour of their park time on a game, but man did we have bragging rights on the schoolyard for years to come! That was the first and last time I ever played this game. 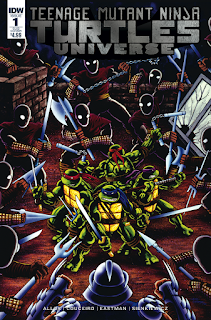 It never received a proper home release on any Nintendo or Sega Systems. There was a Commodore 64 and an MS DOS port that were released, but those were not readily accessible. 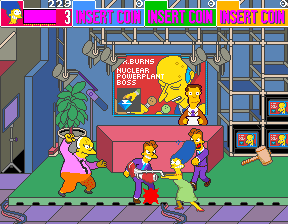 Then in 2012 an HD port of The Simpsons Arcade Game was available through Xbox Live and Playstation Network, but nothing can replicate the magic of playing a multi player arcade cabinet in public with other kids whose only bond is beating the game and having onlookers cheer you on til the end. 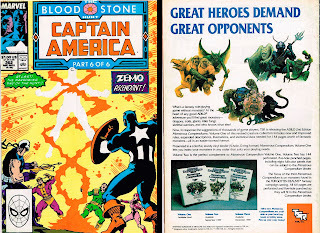 Retro Ramblings: A Winner Is Him! 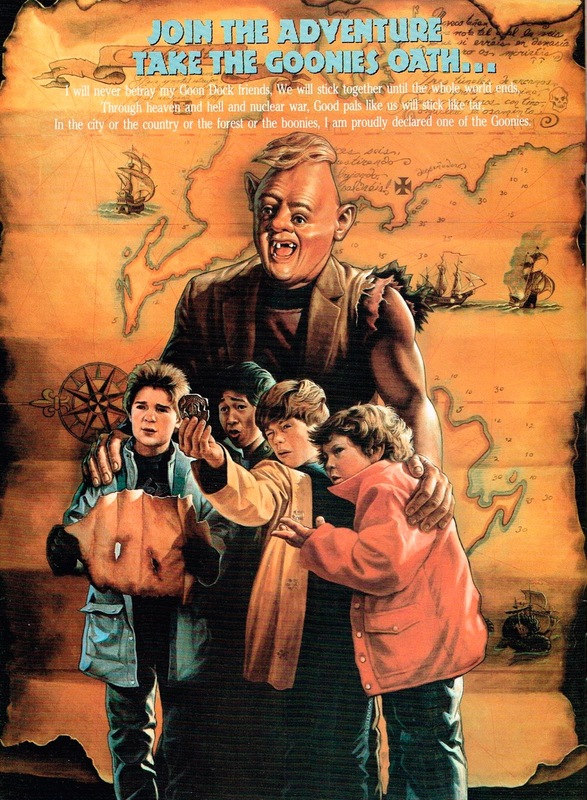 The first time I saw the commercial for The Goonies on TV in 1985 I was hooked. 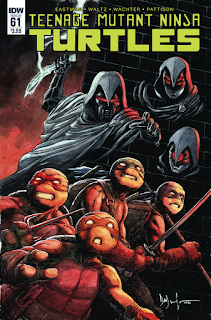 The scene that stuck with me forever was when Mikey and friends were sliding down the tubes to get to the Inferno! I still remember watching that commercial with amazement. Just like every boy who grew up in the 80s, The Goonies were a staple of my childhood. 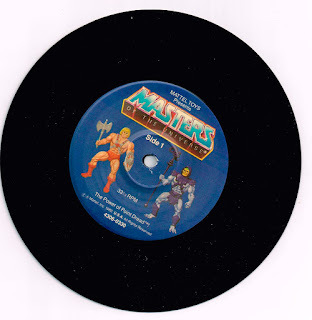 Who didn't want to wrangle up their friends, jump on their Huffy bikes and ride along into a great adventure filled with treasure, danger and cheerleaders? I watched this movie on VHS over and over again until it broke. Then we watched it at my friends house. 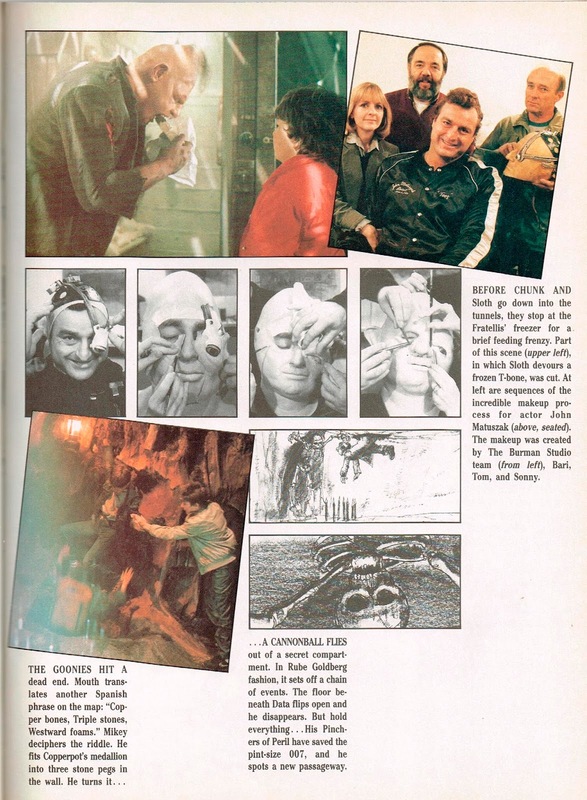 My only negative memory of the film was that there were no action figures, no Happy Meals, no real merchandising for the film. 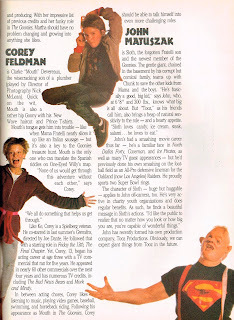 There were some cool things that did come out though. 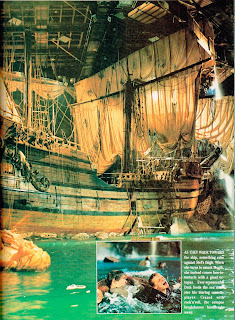 An iffy Nintendo game, Topps trading card set, Cyndi Lauper song and this magazine! The Official Collectors Edition Goonies Souvenir Magazine was printed in 1985 by the good folks at Ira Friedman Inc. It is full of all the pictures and moments from the film we know and love. 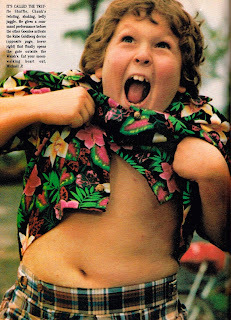 Like this one of Chunk doing the "Truffle Shuffle"! 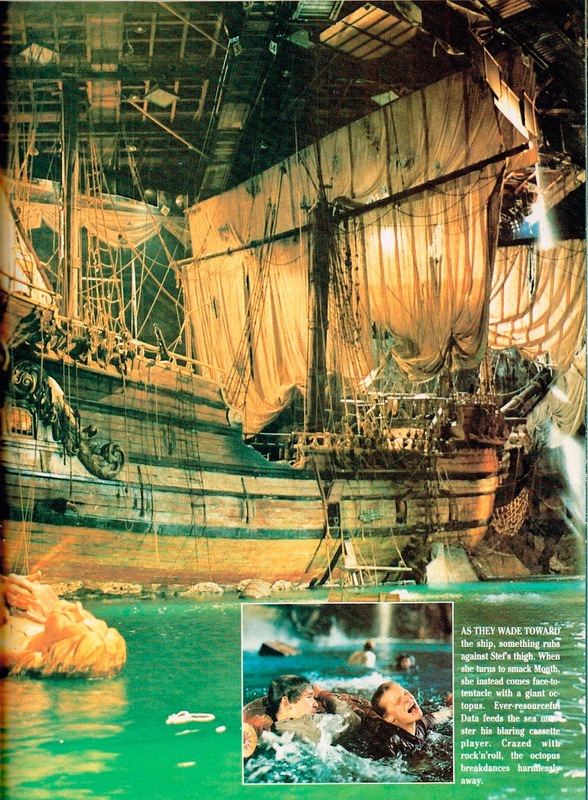 It also contains concept drawings, set designs and behind the scenes photos. 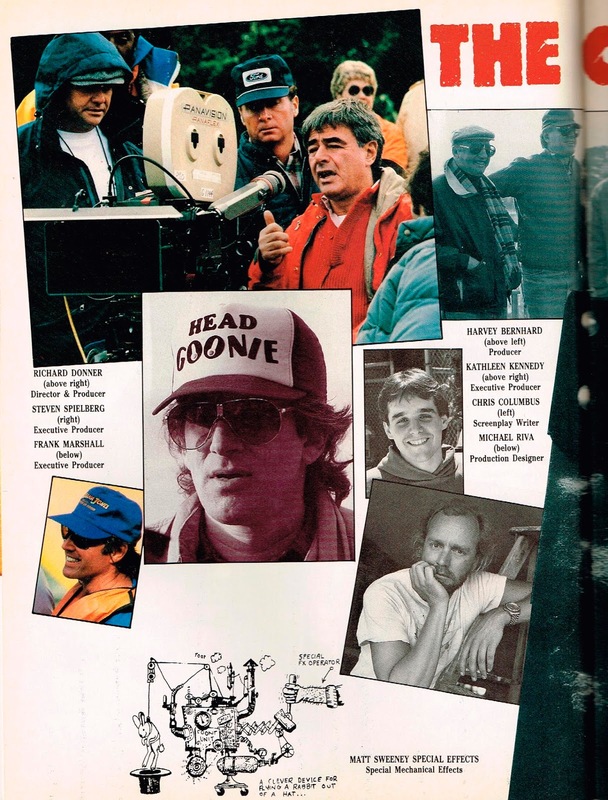 The mag also reveals production secrets. 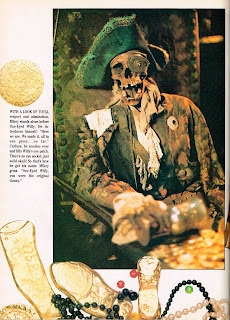 On this page I found out that the FX crew created spiders out of singed pipe cleaners, a perfume expert created a scent that would make the set smell like damp caves and musty old rooms and the scene where the bats fly out of the cave was actually crumpled, black crepe paper shot out of an air-cannon! AWESOME! 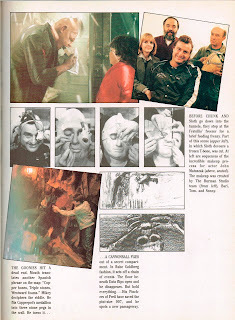 The next page I will share, shows the procedure actor & ex-NFLer John Matuszak had to go through to become Sloth. 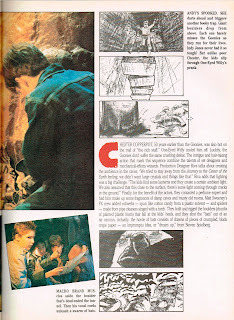 Reading this mag also reveals some deleted scenes! Like this one, where Sloth eats a frozen T-bone steak. Why would they cut this golden moment out? 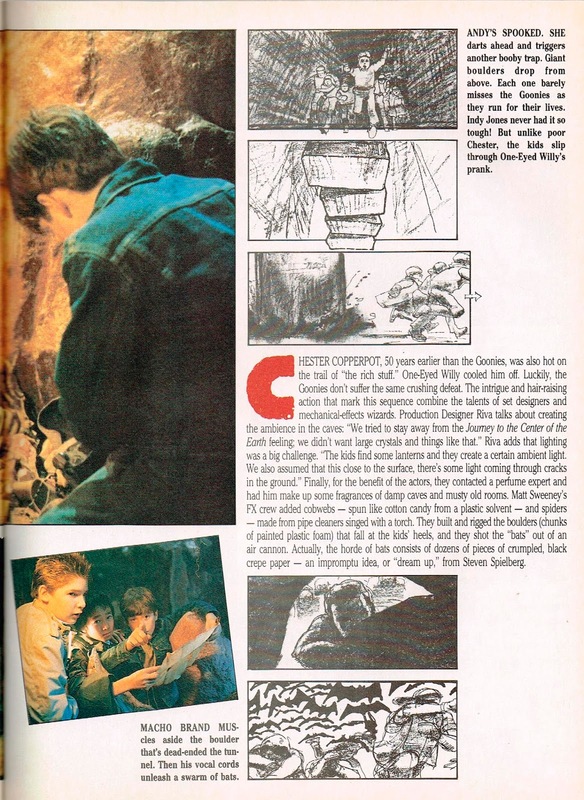 What Goonies article would be complete without mentioning the famous "Octopus Scene"? I swear I saw this scene as a kid on a tape that was recorded off HBO by a friends Grandma? Anyway, this scene was deleted from the theatrical release, but was still included in many marketing materials and even at the end when Data tells a reporter about it! What the hell was that all about? Eventually the scene would be included as a Deleted Scene feature on most recent DVD/Blu-Ray releases. 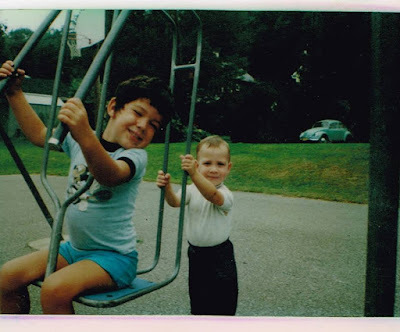 We really weren't going crazy as kids. Thanks a lot Spielberg! One-Eyed Willy was the first Goonie according to Mikey. 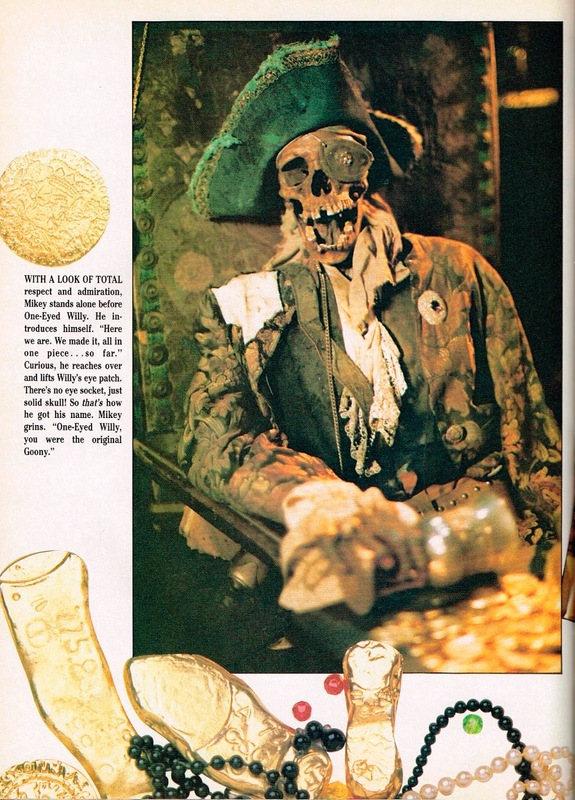 So, even though his skeletal remains were pretty scary for a young kid, you had to show respect to this guy for trying to protect his rich-stuff with mind boggling booby traps. These parts of the movie were the ones we talked about the most as kids. "Did you see that guy that had the knives in his eyes? ", "Data almost died when he fell down that cave!" We loved stuff like that. 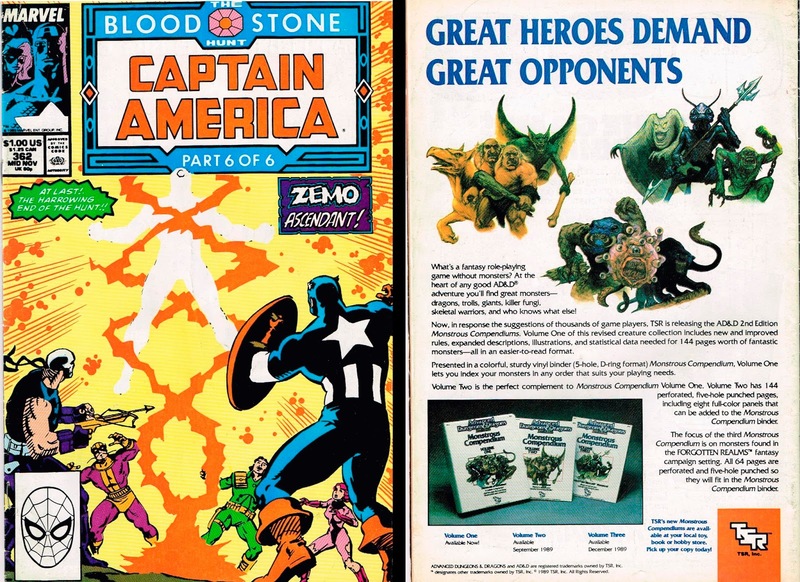 Towards the end we get a bit of "Bonus Material". The story has been told, now we get to dive into the characters and actors themselves. Here we find out that Corey Feldman started acting at age 3 and enjoys horseback riding. Who knew, right? 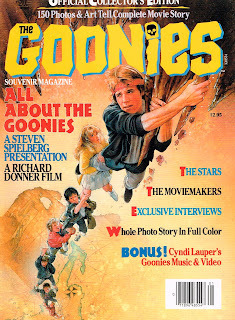 I am proudly declared one of the Goonies. 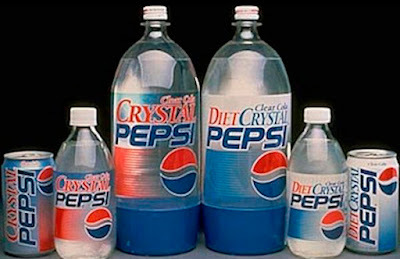 If you don't know already, Crystal Pepsi is back in stores!!! 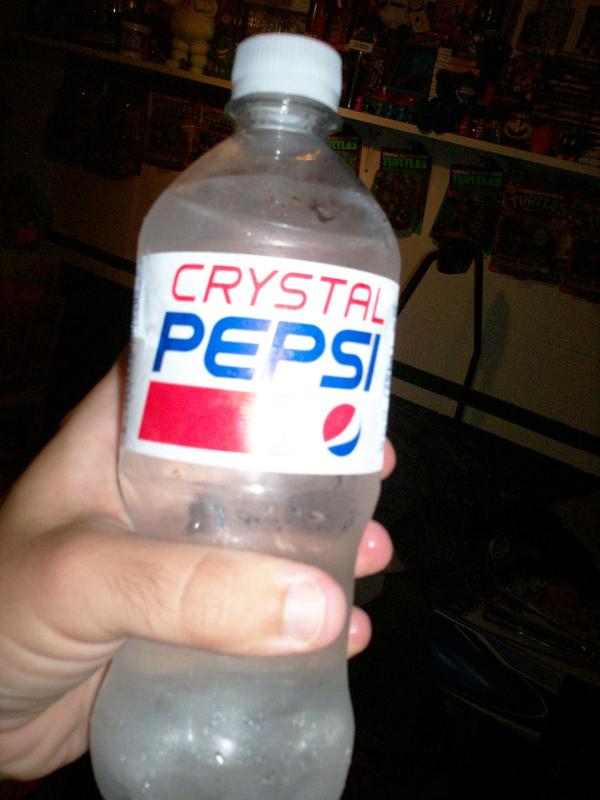 The legendary early 90s soda drink is back!!! 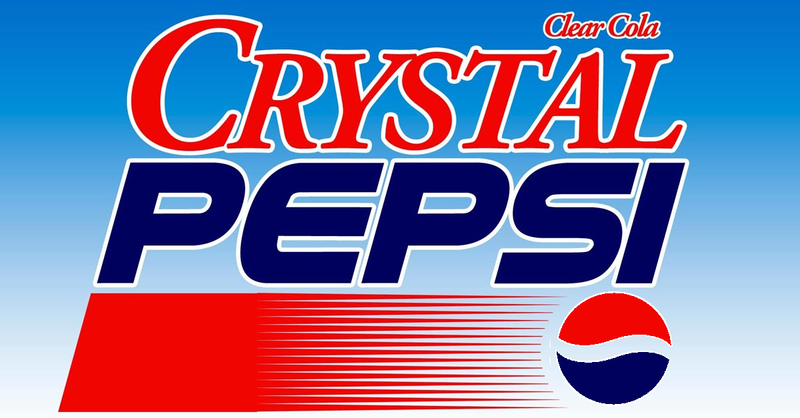 I remember buying a bottle of Crystal Pepsi back in 1993 and not really liking the taste all that much. 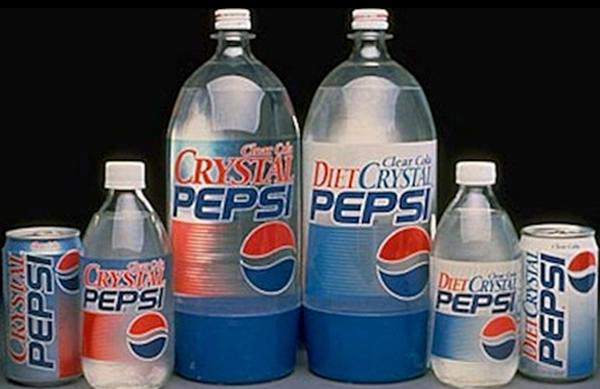 I was young and believed this soda would taste just like a regular Pepsi Cola, but in clear form! Man was I wrong. 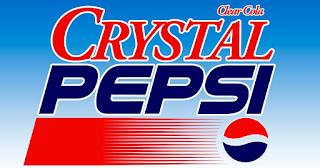 When I heard Pepsi was going to re-release Crystal Pepsi earlier this month, I was ecstatic! 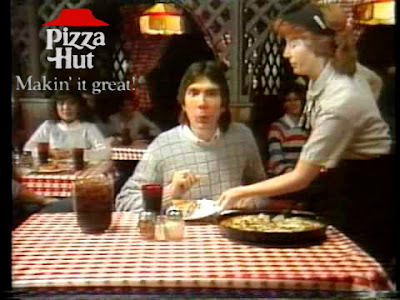 Not really remembering the taste, but the always in your face marketing campaign featuring the now iconic Van Halen song "Right Now". Anyway, I thought I would have another Ecto Cooler level failure on my hands with this release. Still can't find that anywhere near where I live! But, yesterday I stopped by Wal-Mart, checked the cold drinks fridge towards the front end checkout lines and there it was! I grabbed a couple bottles and shared the nostalgia with the kids at lunch. 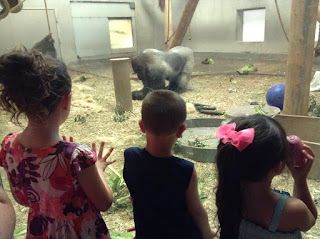 They enjoyed it! The taste was similar to what I remembered. Kind of a lemony, muted cola flavor. Not the most amazing thing I have ever drank, but damn it was good to re-live the 90s one sip at a time. Now let's get to work on bringing back Pogs, Dunkaroos and bowl hair cuts! In recognition of my kids first day back to school, enjoy this fresh jam off the Teenage Mutant Ninja Turtles 2 soundtrack titled "Back To School" performed by Fifth Platoon. 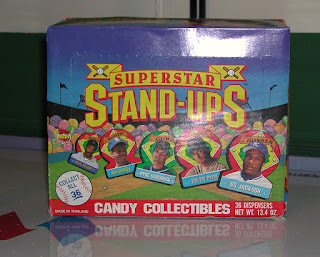 I recently purchased this box of 1991 Topps Baseball Superstar Stand-Ups from e-bay for about $10. 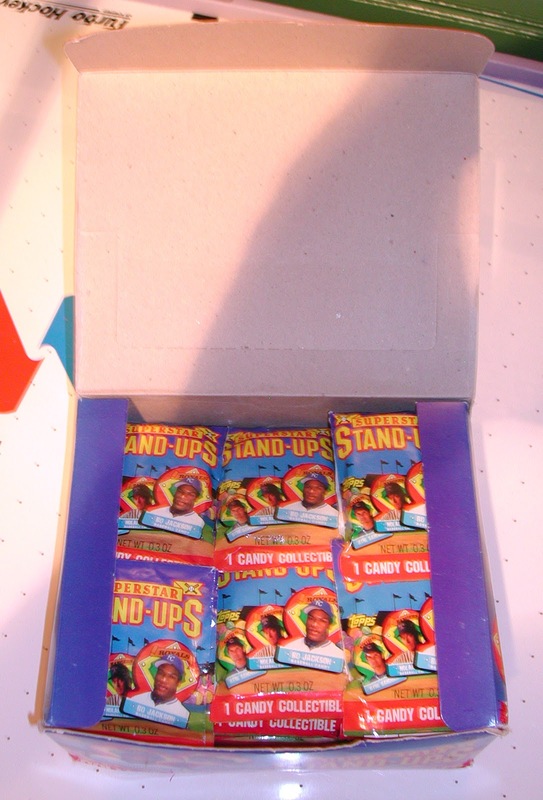 Each box contains 36 individually wrapped candy containers. That's like $0.28 per container! I remember buying one of these as a kid when they first came out in the early 90s. The candy tasted no different than the ones you would find in Topps' candy heads. The real draw was trying to get your favorite player. It was a blind bag before there were blind bags. I believe I got a Ryne Sandberg back in the day. But the one I really wanted was Bo Jackson. That is the reason this box was purchased, to achieve that goal! 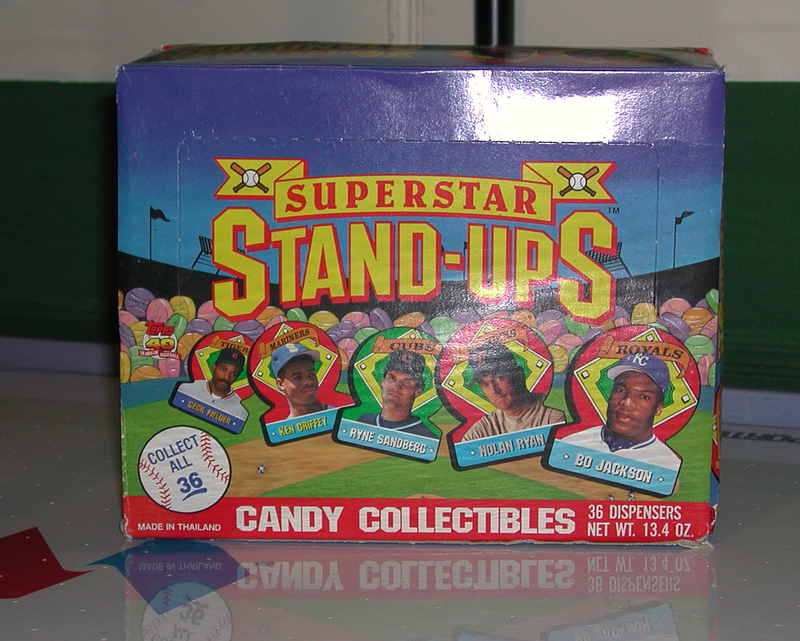 I opened the box and it was bursting with factory sealed 25 year old candy in containers shaped like the heads of some of Baseball's greats like Cal Ripken, Robin Yount, Ken Griffey Jr. and...Bobby Bonilla! What the...BOBBY BONILLA! Like I said, there are 36 packs to a box and 36 different players to collect. Let's see if I can get a whole set? Here is a sample of what was inside. 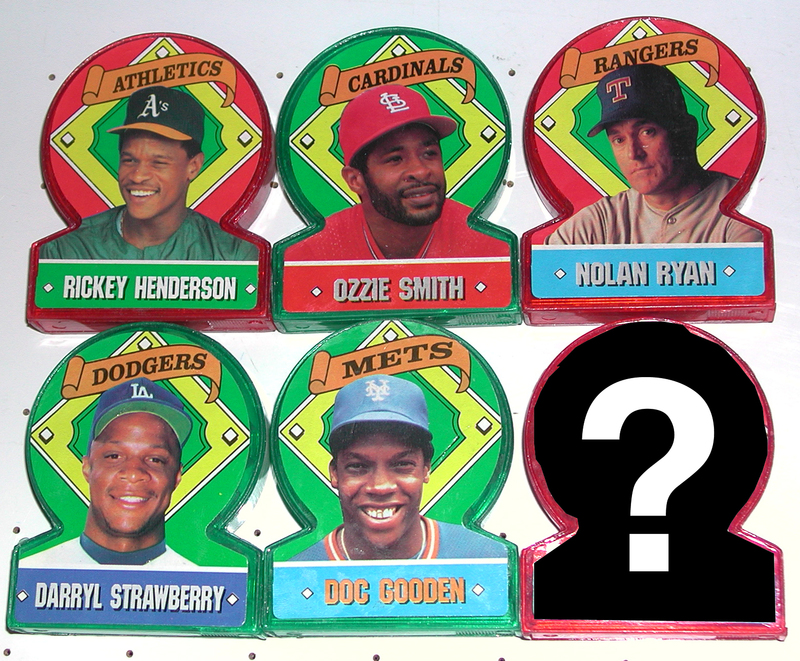 As a Met fan, I was glad to add the Darryl Strawberry & Dwight "Doc" Gooden to my collection. 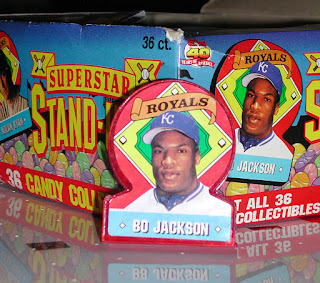 I did not get a complete set, but did I get Bo? Hell yeah I did! And there he is in all his glory. I am so happy. I can finally check this one off my want list! 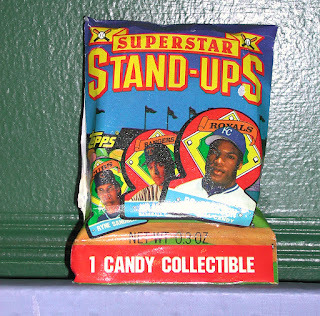 Now you're probably wondering what 25 year Topps candy looks like? It is pretty gross. It looks like the colors from the candies bled into each other and made some type of moldy looking dark brown nastiness. I actually have questioned whether I should eat one or not? Probably not? I actually made this shelf myself and mounted it to the wall in my basement, which used to be my man- cave but has turned into the kids play room. The cool thing is that I made it out of lumber I salvaged from an old news set! As you can see, it's a pretty long shelf filled with some of my favorite collectibles. These include a Nintendo Virtual Boy, Stay Puft Marshmallow Bank, Ninja Turtles Black and White NECA boxed set, video games and much more. Every now and then the kids ask permission to play with some of the toys like Gizmo and the Star Wars X-Wing and I let them. Other things are not to be played with like the Peter Laird autographed Ninja Turtles Frisbee. Sometimes I will just look at the shelf and think of all the good times I had playing with and collecting these items and I hope my kids grow up with the same feelings of happiness. Check out more "Shelfies" from the League by clicking HERE! 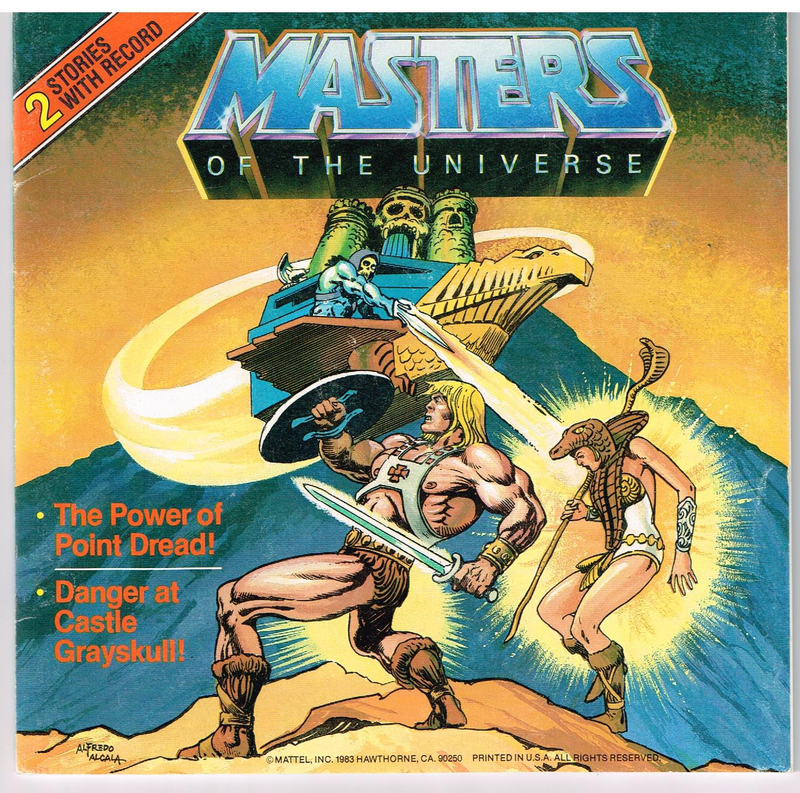 I was lucky enough to stumble upon this almost perfect copy of the Masters of the Universe read along book published in 1983 at a local thrift store. I believe I only paid about $0.50 for this book and let me tell you it is gorgeous! 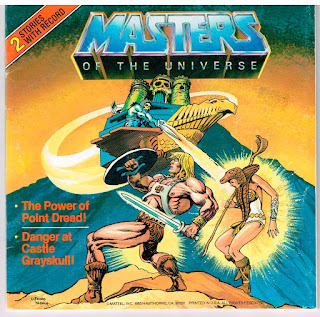 The book contains 2 stories, "The Power of Point Dread" & "Danger at Castle Grayskull". 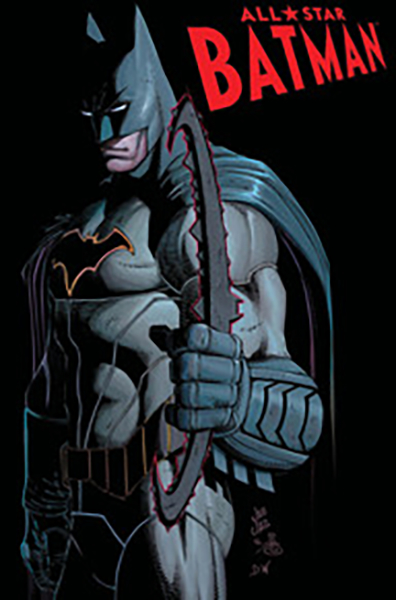 Like I said the artwork in this book is amazing. 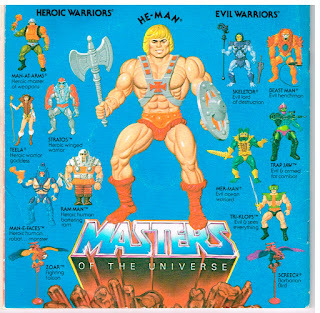 It looks exactly like the drawings you would find in the old Masters of the Universe mini-comics that were packaged with the toys back in the 80s. The renditions of the characters are a bit off from what you would see in the Filmation Cartoon. I don't prefer one over the other, I enjoy both of them as separate universes. 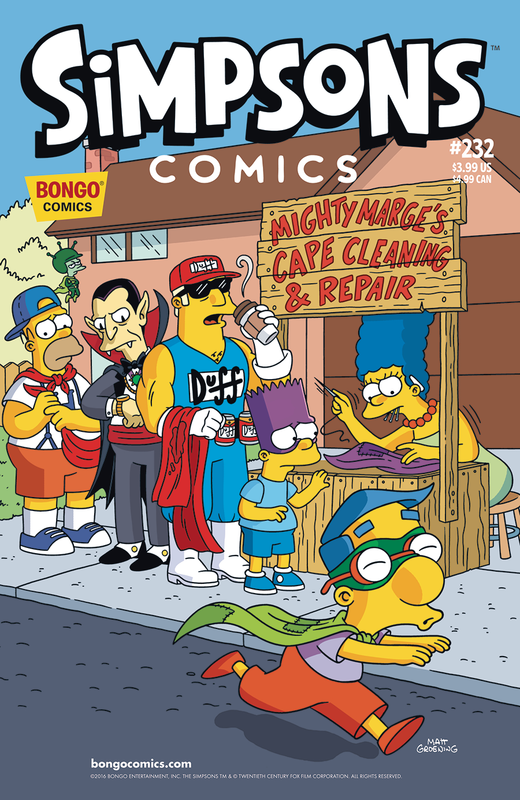 The action in these books is a little more aggressive and way less cartoony than the show, but it still has a little humor in it. Just look at Trap Jaw getting a bucket of water to the face! 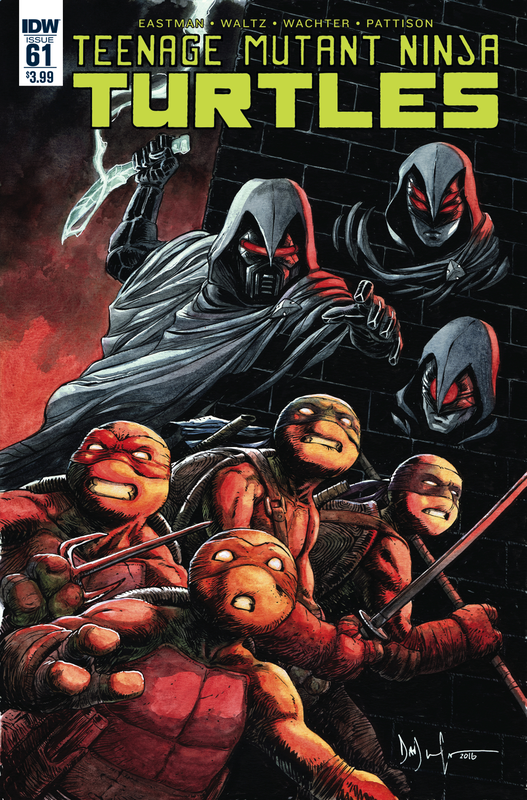 But just like in the cartoon, He-Man and company triumph over Skeletor and his evil minions at the end of each story. Another great addition to this book was the advertisement for Masters of the Universe toys on the back cover. 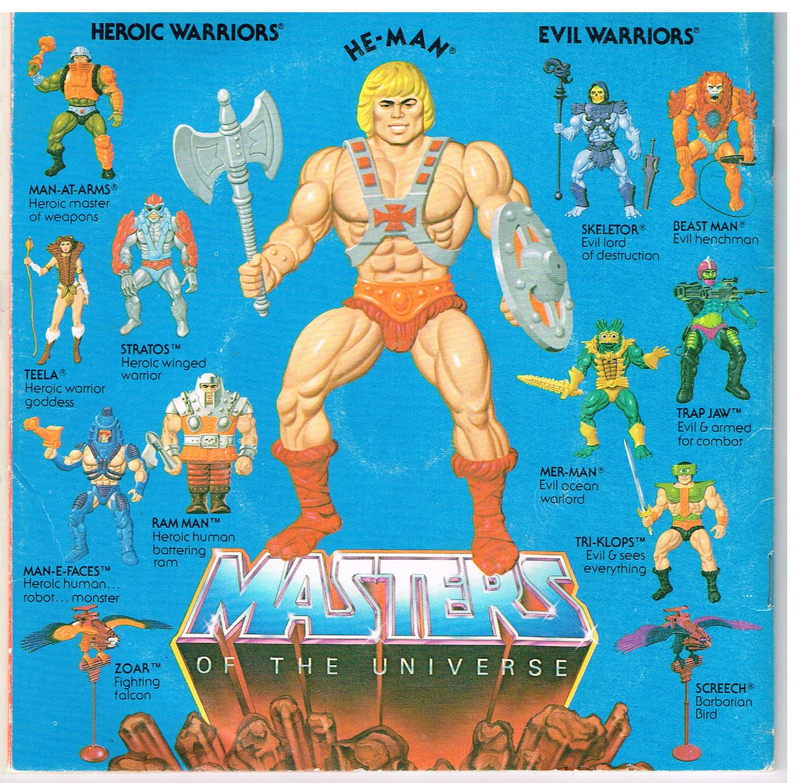 These types of production art work take me back to the day when you would buy a new toy, rip the toy open and then stare at the card back to see what else you could get to build your army of Heroic or Evil Warriors. Time to get my old man on and say, "They just don't make them like this anymore!". Are you wondering if the record was in the book? YES IT WAS! Wow! I don't have a record player to listen to the stories, luckily someone on YouTube does and they posted the audio for all to hear. Take a listen below and take the time to enjoy this literary masterpiece with a loved one today! 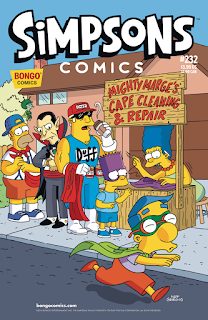 Mayor Quimby turns Springfield's super-heroes against one another when he offers a reward to costumed crusaders who reveal their secret identities, leading Bartman and Houseboy to take different sides in an "uncivil" war. Then Duff Industries develops a new energy drink, and with a new marketing campaign comes the need for a new mascot. Oh yeah! It's Homer Simpson's time to shine. Just wanted to show off this sweet autographed Bobby McFerrin poster from 1990! I found this in a long forgotten corner of my office a while a go. Jealous? Don't Worry. Be Happy! 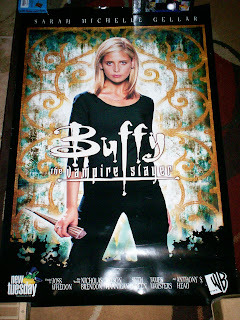 Also found this Buffy the Vampire Slayer poster! The station I work for used to have the WB as a secondary channel back in the day when Buffy was a hot property. I discovered this poster taped to the back of a door in a vacant office. This door must not have been closed for like 20 years, otherwise someone would have grabbed this? I used to watch this show whenever possible. Who didn't love Sarah Michelle Gellar in the late 90s? Enjoy the unaired pilot episode of Buffy The Vampire Slayer from 1996! Took the family on a little vacation last week and ran into 7-11 to grab us up some Slurpees. 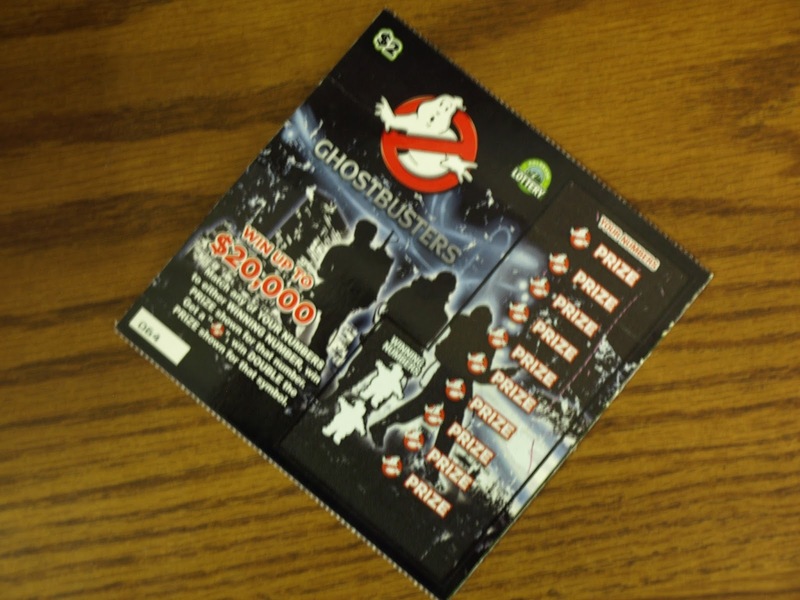 While paying at the counter, I looked down at the see through counter lottery scratch off area and there it was...The Ghostbusters Lottery ticket! You can win up to $20,000 if one of your numbers matches the lucky winning number. I can't wait to see if I can get rich or die trying! Halfway through and no matching numbers! That's okay, I've still got 5 more chances at glory! DAMMIT! Not a winner! Well at least I got this cool Ghostbusters card to add to the junk collection my wife keeps trying to get me to throw out. Hopefully I can find more of these at the local gas station convenience stores? Out running some errands today and had to make a stop at The Dollar Tree. While there I found a few new things in the trading card section. 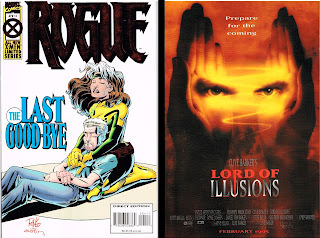 This time around they had comics. Not the 2 comics and 1 pack of cards for a dollar bundles I love so much, but single "Hot Comics" for $1 each. There were not any real winners out of the bunch, but I did grab a couple. 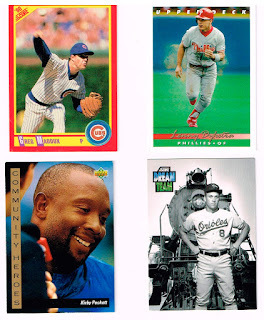 Next up, the Dollar Tree had special 2 packs of vintage cards for $1! I picked up packs of Fleer Adrenaline (2000), Score Football/Soccer (1992) and TriStar Hidden Treasures Hockey (2006). Nothing great in these packs. 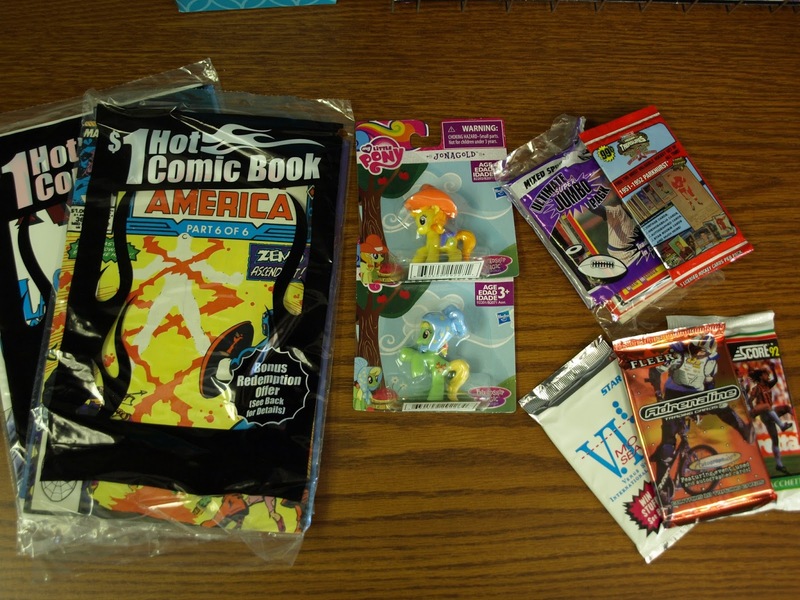 Here are a few examples of what was inside. And lastly I picked up a pack of Star Venus Swimwear International Model Search Limited Edition cards! 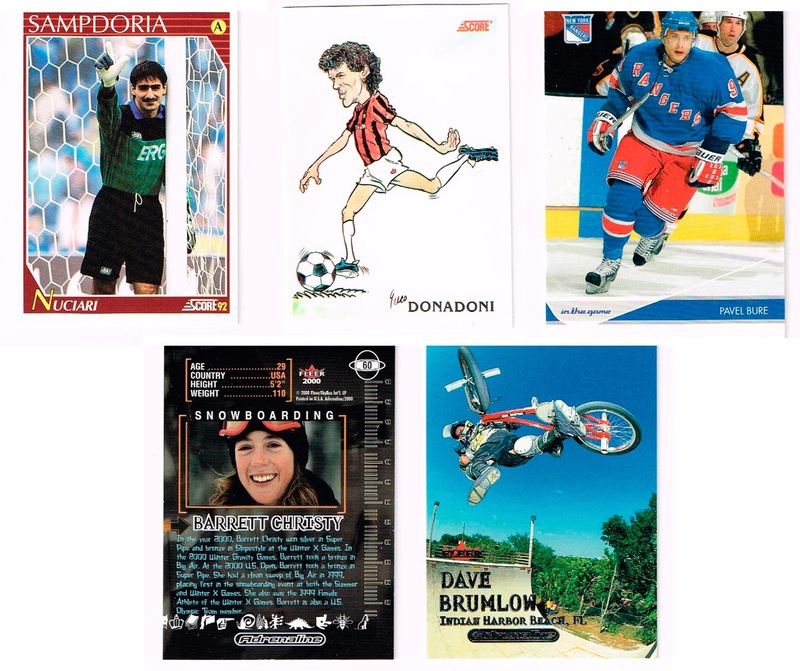 Yes these were a thing and they are totally 90s! Reminds me of old episodes of the show California Dreams. From the hair to the card design to the day glo bikinis. AMAZING! Take a look for yourself. Crazy how styles and tastes change so much over time. 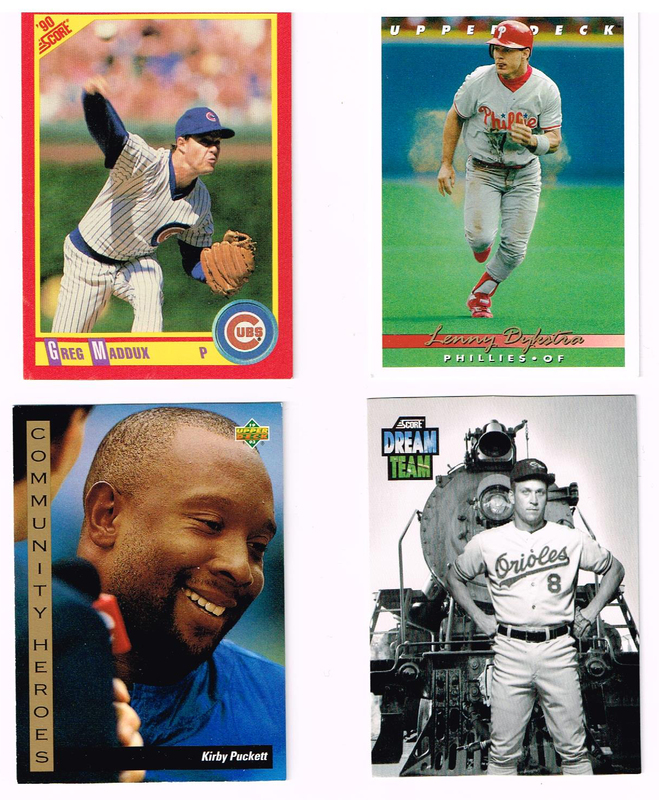 These cards are a true time capsule of the era. Click the video below and enjoy some more 90s hotness courtesy of Kelly Packard and the rest of the California Dreams band!